Eighth state of nine as published in 1878. A brilliant, clear, richly inked impression. This etching shows the clock-tower and buildings of Billingsgate Market on the north bank of the River Thames, with London Bridge to the right, and the tower of St Saviour's, Southwark, in the distance at right. The whole composition is seen in reverse. 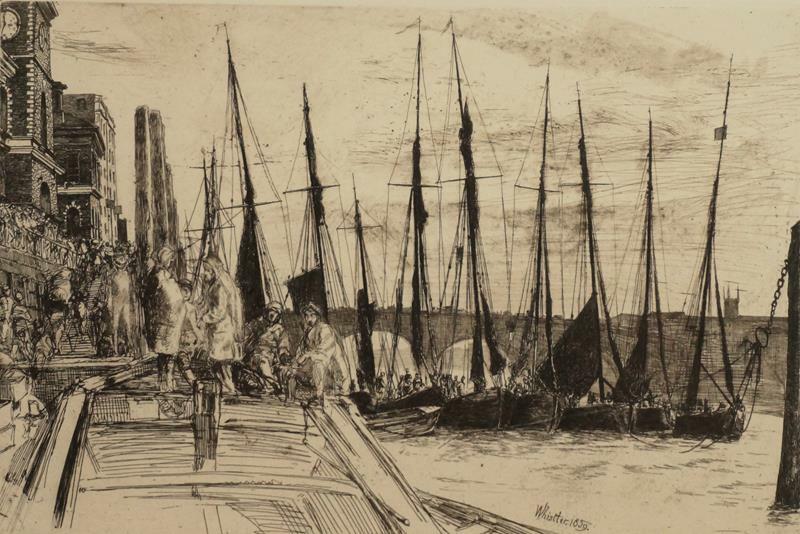 Whistler turned to the subject of the River Thames in the summer of 1859 when he produced his famous Thames Set of etchings showing the banks of the river east of London Bridge including Wapping, Limehouse and Rotherhithe. These run down, dangerous and infested areas fascinated Whistler. He appreciated the picturesque disrepair of the wharfs and warehouses that lined its banks and empathised with those that worked on the river. Britain's largest inland fish-market was originally established in the streets near Billingsgate Wharf at the north end of London Bridge. It was based at Lower Thames Street, in the City of London. The original building, shown here, was built in 1849 but was demolished soon after in 1875 to make way for the French Empire style arcaded market hall that exists today. The market moved to the Isle of Dogs in 1982.